Pet rocks are back! Or, maybe they never went away. They've got a really, really long lifespan, after all. These throwbacks (careful where you aim them, though!) to the 1970s can be a lot of fun to collect or just use for interesting paperweights. 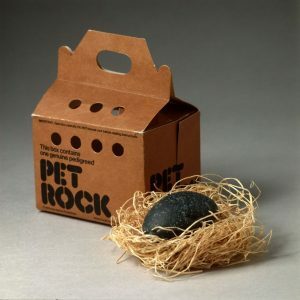 Pet rocks are guaranteed to never need trips to the vet, expensive diets, litter box training, or a fenced-in yard. You can make yours a special house if you want to, or you can just keep it in your pocket or on your desk to admire. Warning: young sedimentary rocks, such as sandstone and conglomerates, may shed. Consider adopting a more mature rock. Play up your pet rock's silly side by adding google eyes, feathers, pipe cleaners, glitter, or anything else you think might be fun. You can use the rock as a canvas or let the rock's shape tell you what it wants to be: a mouse, a rocket, a clown, a bird, or whatever you see. Acrylic paints work best. They are sturdy, bright, and can be cleaned up with water. The first official "pet rocks" that were sold in the 1970s were simply nice stones from Rosarita Beach in Mexico. These pebbles sold for a penny and were resold with goofy accessories for a lot more. They looked, well, like a typical rock. If you want to be traditional, you can try to order one of these stones, but there are perfectly terrific types of rocks in your own great outdoors. Quartz is one of the most common types of rock. You may find specimens that have already been chipped and will show off their pretty crystals. When you travel with your family, look for rocks that are native to the place you are visiting. Some rocks may carry fossil traces from the times of the dinosaurs or even earlier. Igneous rocks, born in the fire of volcanoes and lava, might be slick or rough, depending on how and where they cooled. Geodes are found in Indiana, Kentucky, and Illinois, among other places. These "thunder eggs" form breath-taking crystals. Your rock collection can mark your travels and adventures throughout your whole life. You can learn more about rocks in the library and online. Click on any title to go to its catalog listing where you may place a reserve by using your CRRL library card. The Art of Painting Animals on Rocks by Lin Wellford. Turn your pet rock into a rock pet with acrylic paints and advice from the author. The Magic School Bus Inside the Earth. Your pet rock has an exciting and proud history! Discover how rocks form from fire, water, wind, and pressures from bigger rocks with Ms. Frizzle and her class. Rock Collecting by Roma Gans. A good guide for young readers on how to recognize different kinds of rocks to start their own collections. A boy who has "rocks in his pockets and rocks in his head" grows up in America's hard times of the 1920s, but he never forgets his dream and eventually lands a job as a curator of minerology in a museum. An important picture book to share with early elementary classes. A great rock painting resource. Step-by-step pictures for beginners, tips from talented rock painters, supplies, recommended reading, and how to repair damaged rocks. A geologist answers kids' questions about rocks and minerals. These rocks are beautiful enough to not need any decoration. This is a commercial site, but it includes an outstanding collection of pictures and scientific information for true rock-a-holics. Rocky the Rock Hound teaches how rocks form and how to collect them safely. Try the quiz and pebble puzzles!